What are the type of sadhana that I must do for my problem/disease/issue. 1. Sakam Sadhana: This is when the sadhak has an intention or desire or focus on one remedy or solution. For example, a sadhak wants to cure an ailment and with the intent to cure that sadhana the sadhak does sadhana. In this sadhana, the once the remedy or solution or result is achieved every punya balance comes to zero since the intention was on achieving results for that particular ailment. Then the sadhak does another sakaam sadhana focusing on what is wanted next. Here, the results are very limited since the sadhana keeps working only for that desired results (the cause of which could be multiple). The causes may be even interlinked to so many other issues in life. 2. Nishkam Sadhana: This is when a sadhak has no particular intention but just does sadhana sincerely. Slowly, little by little all the karmic factors start dissolving, which in turn were causing all type of sufferings including that ailment. So, when the cause itself is dissolved with nishkam sadhana not only that ailment but lot of other issues and problems that were being caused by those karmic factors are also released. Thus, one moves towards self-realization by slowly purifying one's body, mind and soul. Babaji always tells sadhaks to do nishkam sadhana. What if I am not able to sit for long durations for doing sadhana due to physical discomfort? If there is lot of discomfort due to physical ailment or problems, then one can do Mahamruthunjaya chanting as much as possible. Remember, it is not the quality of time nor the quantity of japa but the quality of time and japa. 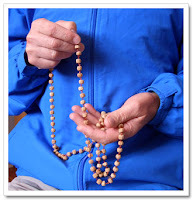 Ideally, one can use the beads for count but do not pay much attention to the number of counts. Ideally, I have seen that it takes one round (108) for the mantra to give effects but this again is not a landmark. It will differ from person to person and also depend highly on how absorbed one is in the meaning of the mantra. The mantra should always be pronounced rightly and every word should be meant while reciting and one should merge with the feeling of the mantra. When this happens, the count just becomes least important. If there is pain or discomfort be relaxed being sure that Lord Mahamruthunjaya will certainly clear your ailment and know that you are slowly getting healed. Do not keep expectations on miracles or immediate results. This is because the cure depends on how much of trust and focus you have in healing and also depends on how thick that karma is that is causing you trouble. So have patience in the process and do not focus much on the discomfort. If you are not a ShivYog sadhak, then it is highly recommended that you attend Babaji's shivir as early as possible. Do not worry much about how you will be able to sit or be there for so many days. Babaji even says, "Come lying down if you are even not able to sit." There will be a lot of difference because Babaji's gives you healing and make things easier for you to practice. Plus, the knowledge and methods of doing sadhana that you will learn is priceless. Then, when you practice the sadhana you will see that it is much easier and also much of your karmas will be released by then. Nothing to think much or discuss much about shivir, just go! Till then there are simple things you can do. Accept 100% responsibility for whatever condition you are in. Release unwanted emotions of guilt, fear and resentment. Practice forgiveness and keep sending love to anything and everything that you come across. a) Before Dawn i.e. before Sun rises ? b) when it is cloudy or no sun visible ? c) any other time (like evening/night) ? This same question was asked by one person in Pune shivir 2008. Mritsanjeevani is done after sunrise and before sunset but clouds or non-visibility does not matter. Babaji also said that one must face the sun's location while doing this but in case it is not at all possible, then any position is okay.